The problem with a blog format is juicy and scary stories gradually get pushed to the bottom of the heap and people no longer find them So, periodically, we will refresh some of the better submissions as a blast from the past. Here is a wonderful story about a boy…. About 30 years ago, a friend of a friend’s sister was getting married, and I somehow found myself invited to the stag. I’d never been to the house before, and as we waited for the groom to arrive, the bride’s mother insisted we have a cup of tea. 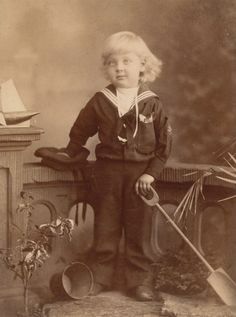 We sat chatting about nothing in particular when, out of the corner of my eye, I became aware of a young boy, perhaps 7 or 8, dressed in a sailor suit go into the kitchen, and thought nothing of it. As we sat, the boy came out of the kitchen, and stood, very politely, beside my chair. I turned and said “Hello, what is your name?” He very politely introduced himself as James, then chattered away for a couple of minutes about school, games and the cat, before announcing that he was going upstairs. Half an hour later, as we were leaving, I shouted up the stairs, “Bye-bye, James.” Our host looked startled, and asked who James was. Turned out there were no children in the house, let alone one wearing a sailor suit.